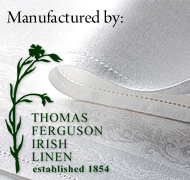 Tomary House Ltd is an online retailer supplying a wide range of Irish linen products. 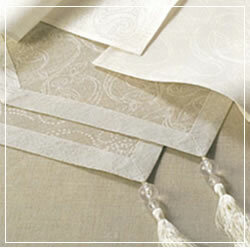 Our products include Irish Table Linens, Bed Linens and Linen Gifts. We continuously monitor our online competitors prices to ensure that you will not find these products cheaper on any other online store. Through our confidence in the care that we take to keep prices as low as possible, we can faithfully promise to match the normal retail price of any identical piece of bed linen, table linen or other linen product found with any of our online competitors. You may also want to take into consideration that all orders over £150 are delivered free of charge to the UK and Ireland. We understand that when purchasing online that you do not get the opportunity to sense the true quality of our products. Tomary House Irish Linen is committed to providing you with total satisfaction. You may cancel your purchase of goods by notifying Tomary House Irish Linen in writing within fourteen days of receiving the goods. You must then return the goods to Tomary House at your own expense. Note that if you fail to take reasonable care of the goods or soil or launder them Tomary House reserves the right not to accept their return. Tomary House will refund the full purchase price to you within 30 days of the receipt of your notice of cancellation.